Cell culture is also the basis for bioprocessing, e.g., the production and purification of proteins, including antibodies, for therapeutic purposes. Recombinant protein therapeutics are generally manufactured by large-scale cultivation of genetically engineered host cells, such as hybridoma cells or chinese hamster ovary (CHO). Despite the availability of a multitude of cell lines, nearly 70% of all recombinant protein therapeutics are nowadays produced in CHO cells. Cell line–specific MACS® Media include products for the cultivation of CHO and hybridoma cells. Culture conditions differ from one cell line to the other. Different cell lines require specifically formulated media due to individual requirements of the cells, e. g., pH, osmolality, concentration of amino acids, or nutrient supplements. Adherent cells, e. g., fibroblasts, epithelial/endothelial cells, and chondrocytes grow on coated or non-coated surfaces, whereas cells in suspension, e. g., lymphocytes and CHO cells, float and grow in nutrient solution. Culture media for human and animal cells can contain a variety of ingredients. The composition varies between different cell types. Human or animal cells grow very well at a pH of about 7.4. Depending on the cell type and the source of the cells the optimal pH value might differ slightly. Therefore, the pH range that is suitable for culturing a particular cell type is specified in the data sheet of the respective cell culture media. The ambient temperature for human or animal cells within the body is about 37 °C. This corresponds with the optimal temperature for cultivation in vitro. Miltenyi Biotec has created guidelines for dedicated applications supporting the maintenance of HSCs, MSCs, iPS cells, NK cells, T cells, neural cells, DCs, for example. The composition of media is characterized by a number of criteria. Here is a guide to some of the most commonly used terms and abbreviations. Serum is known to provide a rich culture environment. However, its composition is ill-defined and differs between lots. The use of serum is therefore a common reason for experimental variability. Serum-free media eliminate the need for full serum, such as human AB serum or fetal bovine serum (FBS). They may still contain individual serum proteins, such as albumins or immunoglobulins. However, the use of purified protein fractions reduces the risk for lot-to-lot variability. Xeno-free indicates a formulation in which all components are derived from the same species. For instance, a xeno-free medium for human cells is expected to contain only proteins of human origin or recombinant proteins. In a rigorous definition, chemically defined means that a formulation contains only chemically pure substances. If proteins are included, they need to be of recombinant origin, expressed in a well-characterized expression system, and purified to a degree that eliminates potential contaminants. Some suppliers include human or bovine albumin fractions into their definition of defined substances. However, as biological carrier molecules, albumins are naturally loaded with a number of different substances and these substances may vary between donors. Albumins are therefore a known source of variability, especially if batch variations and donor variability are not controlled for. In the context of cell therapy applications, albumins still have their place: If variability can be excluded with appropriate assays, they can increase the robustness and performance of a media formulation. One of the keys for the successful translation of scientific discovery into clinical application is the necessity to obtain high-quality data right from the beginning, consistently and reproducibly. To achieve this, Miltenyi Biotec has developed a spectrum of products for all aspects of translational research that allows researchers to go from bench to bedside without unnecessary, time-consuming, and expensive extra rounds. As an example, a project can start with Miltenyi Biotec’s research-grade products and move seamlessly from premium to GMP grade, which would be the most adequate grade for, e.g., the development of a cellular therapy to be tested in the clinic. This approach helps to accomplish a truly smooth and seamless translation. L-Glutamine is an essential amino acid required to grow mammalian cells in vitro. Glutamine is a major nitrogen and energy source for many mammalian cells in culture (PMID: 6690331, 18587813). The primary waste product of glutamine metabolism is ammonia which is known to inhibit cell growth by damaging the cell membrane (PMID: 18561227, 18587813). L-Glutamine is temperature sensitive and degrades during storage or exposition to higher temperatures (room or incubator temperature). To avoid this problem fresh L-glutamine should be added to the medium at the time of use. Another option is to use a medium containing a stabilized dipeptide form of L-glutamine, L-alanyl-L-glutamine, which can be metabolized by many cells just like L-glutamine. Cells in culture produce acidic products which lower the pH of the medium over time. Therefore, CO2/bicarbonate or organic (HEPES) buffering systems are added to control the pH. The optimal range to grow mammalian cells is pH 7.2–7.4. Nevertheless, cells can survive over an even wider pH range of 6.6–7.8. It should be kept in mind that buffers only slow down the pH change. Miltenyi Biotec’s cell culture media are formulated to include the optimal buffer mix and concentration for the corresponding cell type. To monitor the pH of a cell culture medium, most formulations contain phenol red as an indicator. The color of the medium changes from red to violet with rising pH values and to yellow at acidic pH values. Due to its estrogenic activity phenol red is not wanted in some applications. All GMP-grade media from Miltenyi Biotec are formulated without phenol red because of the undesired effects the indicator could have. For more than 80 years fetal bovine serum (FBS) and other animal-derived materials have been widely used in cell cultures for the production of vaccines or biotherapeutics. In the past there have been several approaches to replace FBS by other ingredients to avoid the use of this critical component. For most applications it is still not possible to avoid human components completely. However, most of the media from Miltenyi Biotec are serum free or xeno free (XF) thus increasing the safety of the products. The quality of cell culture ingredients like cytokines and growth factors dramatically influences the properties and function of cultured cells. Therefore, consistent products of high quality are essential for reliable, meaningful results. Miltenyi Biotec offers an extensive portfolio of recombinant cytokines and growth factors for demanding cell culture applications such as differentiation studies and functional assays. Cytokines engineered by Miltenyi Biotec can be recognized by the acronym “IS” in the product name. IS stands for improved sequence. These engineered variants guarantee high stability, better solubility during reconstitution than the corresponding native cytokines, and high activity in culture. MACS® GMP Cytokines support the development of cell-based therapies in pre-clinical and clinical research. They are produced in Miltenyi Biotec’s GMP facility in Germany, which is equipped with production areas from class A to D.
MACS GMP Cytokines are manufactured in compliance with relevant GMP guidelines and follow the recommendations of United States Pharmacopeia, chapter <1043> on ancillary materials for cell, gene, and tissue-engineered products. Standardized manufacturing processes include automated aseptic filling, lyophilization, and finishing. All tests are documented on the lot-specific certificate of analysis. Additional documentation like a Certificate of Origin including a TSE/BSE-statement is available upon request. Premium-grade MACS Cytokines are recombinant cytokines with high activity and low endotoxin level, ideal for cell culture applications in pre-clinical research. All premium-grade cytokines are lyophilized without carrier proteins or preservatives and the special formulation with mannitol and trehalose enables fast, reliable reconstitution, and increased stability. Lot-specific certificates of analysis (CoA) are available per request from Miltenyi Biotec’s technical support. Research-grade MACS Cytokines are recombinant cytokines suitable for cell culture applications, differentiation studies, and functional assays. Characterization of Human IL-4, premium grade. (A) Dose-response curve for the biological activity of Human IL-4 as determined by a proliferation assay using TF-1 cells according to Kitamura et al. [PMID: 1832294]. (B) Comparison of the specific activities of Human IL-4 from Miltenyi Biotec (red bar) and another commercially available product (black bar). (C) Mass spectrometry analysis (ESI-MS) of Human IL-4. The peak corresponds to the calculated mass of 15088 Da. (D) SDS-PAGE of Human IL-4 under reduced (R) and non-reduced (NR) conditions. Typically, a cytokine binds to a specific receptor on the cell surface and induces intracellular signaling. This can lead to measurable changes in DNA and protein synthesis, for example, which usually result in induction or inhibition of cellular activities such as proliferation or activation. To keep these effects consistent across experiments, in other words, to obtain reliable cell culture results, it is important to use the same defined cytokine activity in each experiment. The biological activity of a cytokine is determined by a standardized assay that measures cytokine effects on cell lines or primary cells. Biological activity is usually expressed as ED50 (e.g. ng/mL) or specific activity (e.g., units per mg of protein, U/mg). The ED50 value is the cytokine concentration at which 50% of the maximal biological activity is reached. Oftentimes activity assays are not calibrated. In these cases, ED50 and U/mg values are only valid for that particular assay. Even minor variations in the assay conditions can result in a different activity. Moreover, ED50 or U/mg values determined by different assays usually deviate from each other substantially and therefore cannot be compared to each other. Drawbacks mentioned above can be overcome by calibrating the respective assays with defined international standards, i.e., reference cytokines whose activity has been certified by the National Institute for Biological Standards and Control (NIBSC). Cytokine activity measured with such calibrated assays is expressed as international units/mg (IU/mg). For further information on international cytokine standards visit the NIBSC website. At Miltenyi Biotec, cytokine activity assays are calibrated with these international NIBSC standards. As a result, the measured activity of MACS Cytokines is not dependent on the type of assay and not prone to variation due to assay variability. It should be kept in mind that activity values from different suppliers are only comparable when all assays are based upon the international standards. Miltenyi Biotec specifies the minimal biological activity of any MACS Cytokine in the respective product data sheet. Lot-specific biological activities of premium-grade and MACS GMP Cytokines are provided in the Certificates of Analysis (CoA). It is important to know that the minimal biological activity of a particular cytokine holds true for any production lot of this cytokine. The lot-specific biological activity is measured for each individual lot of a particular cytokine and is usually higher than the minimal biological activity. Lot-specific biological activities provide the basis for calculating the amount of cytokine that exactly corresponds to the desired units to be added to the culture. Precise cytokine dosing helps avoid oversaturation. Moreover, cytokine consumption in the laboratory can be reduced significantly (see figure). Effective cytokine usage with optimal unit dosing. Green arrows indicate cytokine concentrations that result in maximal cellular response. Identical response levels can be reached with cytokine concentrations of 100 IU/mL and 1,000 IU/mL. Yellow and red arrows indicate insufficient cytokine input. Green arrows indicate cytokine concentrations that result in maximal cellular response. 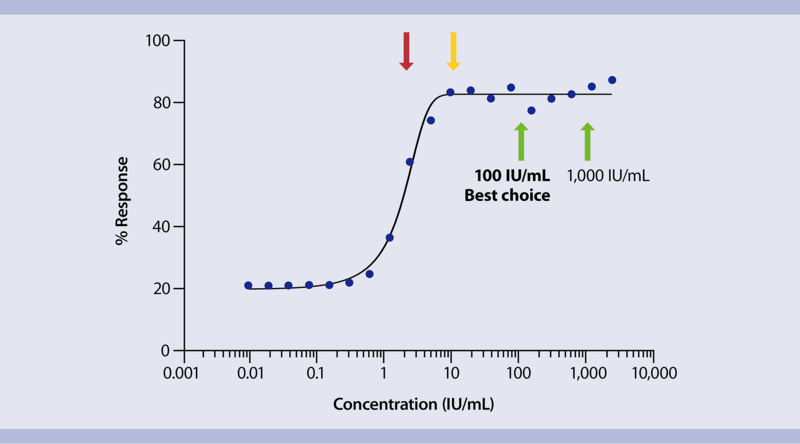 Identical response levels can be reached with cytokine concentrations of 100 IU/mL and 1,000 IU/mL. Yellow and red arrows indicate insufficient cytokine input. Reliable and effective methods for the activation and expansion of primary cells are of great importance for a detailed and accurate downstream analysis. Miltenyi Biotec offers unique reagents for both antigen-independent and antigen-specific stimulation of a variety of target cells, based on stimulating particles, recombinant proteins, peptide pools, or antibodies. The reagents enable different approaches to cell stimulation and so ensure a reliable experimental outcome. PepTivator Peptide Pools allow for the efficient in vitro stimulation of antigen-specific CD4+ and CD8+ T cells. Cell stimulation with these peptide pools is at least as effective as with whole protein antigens. PepTivator Peptide Pools consist mainly of 15-mer peptides with 11-amino acid (aa) overlaps spanning the complete sequence of the respective antigen. The length of the individual peptides is designed to cover CD4 epitopes (12–15 aa) as well as CD8 epitopes (8–11 aa), thus ensuring the optimal stimulation of both T helper and cytotoxic T cells. The short overlapping peptides cover the complete sequence of the protein and are suitable for binding to MHC-I as well as MHC-II complexes. They are designed using the UniProt database as reference. Some proteins exist in several isoforms. Generally, isoform 1, i.e., the isoform termed “canonical” sequence in UniProt, provided the basis for developing the corresponding PepTivator Peptide Pool. Exceptions are clearly indicated in the data sheet. Principle of PepTivator Peptide Pools. Peptides are mainly 15-mers, spanning the complete sequence of an antigen by 11-amino acid overlaps. Peptides are mainly 15-mers, spanning the complete sequenceof an antigen by 11-amino acid overlaps. Peptide pools are valuable tools for measuring the T cell response to an antigen, e.g., in immunomonitoring, generation of antigen-specific T lymphocytes, or pulsing of antigen-presenting cells for research on dendritic cell vaccination. The portfolio of PepTivator Peptide Pools covers an extensive range of virus- and tumor-specific antigens. 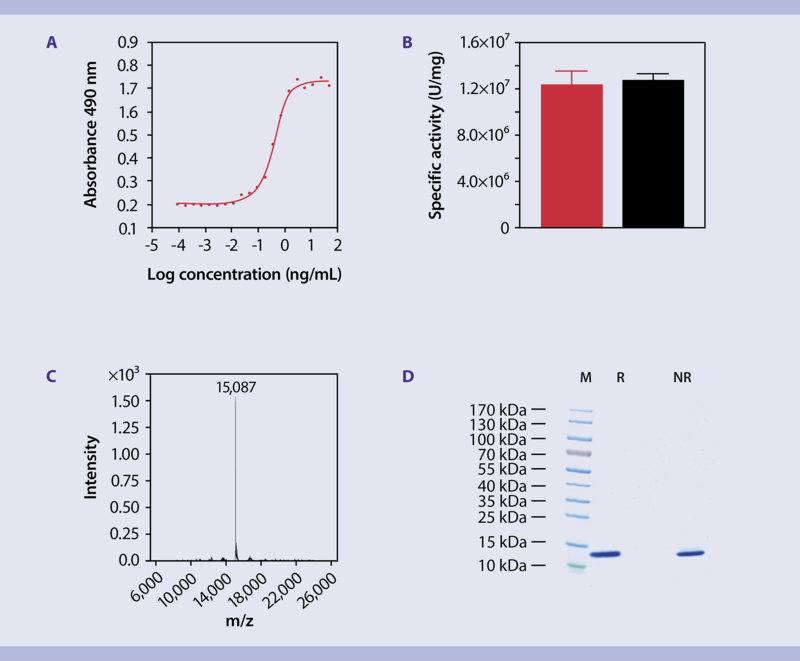 Once stimulated, antigen-specific T cells can be easily isolated using the unique MACS Cytokine Secretion Assays or the CD154 or CD137 MicroBead Kits. The resulting cells are viable and can be used immediately for downstream applications. Cytokine production and secretion of activated T cells can be measured using the Rapid Cytokine Inspector or MACSPlex Cytokine Kits. • Designed to be used as part of the CliniMACS® Cytokine Capture System (CCS) or loading of dendritic cells for optimal antigen presentation. • Designed following the recommendations of United States Pharmacopeia, chapter <1043> on ancillary materials. These peptide pools are free of animal-, or virus-derived components. • Product specifications are confirmed by batch-specific certificates of analysis. PepTivator Peptide Pools – premium grade Peptides individually purified (>80% purity) and endotoxin tested. Two sizes for stimulation of 10⁸ or 10⁹ cells are available. PepTivator Peptide Pools – research grade Average purity of 70%; broadest range of antigens. Toll-like receptors (TLRs) are expressed by various different immune cells playing a role in the early innate immune response. TLRs recognize a wide variety of molecules expressed by microbial pathogens, called pathogen-associated molecular patterns (PAMPs). Miltenyi Biotec provides TLR7/8 and 9 agonists, antagonists, and respective controls for the study of immune cell activation. TLR7 and 8 are involved in the response to viral infection. They recognize single-stranded RNAs as their natural ligand and also small synthetic molecules. Miltenyi Biotec provides synthetic single-stranded RNAs (ORNs) and respective controls for the activation of TLR7 only, TLR8 only, or TLR7/TLR8 simultaneously. As TLR7 and 8 are expressed on cellular compartments, the ORNs need to be transfered into the cell. To this end, all ORNs include DOTAP-Cl, the transfection reagent for optimal delivery. ORN R-2176-dT, exclusively available from Miltenyi Biotec, can be used without transfection reagent. TLR9 recognizes CpG motifs, which are abundantly present in microbial genomes but rare in mammalian DNA. Therefore, TLR9 plays a crucial role in the recognition of microbial pathogens. Synthetic oligonucleotides containing CpG motifs (CpG ODNs) mimic the immune-stimulatory effect of bacterial DNA, promoting TH1 and proinflammatory cytokine induction. Four classes of TLR9 agonists are available that elicit different cellular effects, as shown in the table below. These antagonists consist of short single-stranded oligodeoxynucleotides with different sequences. They can inhibit activation of TLR7/8 and/or TLR9. Miltenyi Biotec offers four TLR antagonists and control reagents with distinct inhibitory capacities. T Cell TransAct is a ready-to-use reagent for the activation and expansion of human T cells. It is a polymeric nanomatrix pre-loaded with CD3 and CD28 agonists. Due to its nano-sized matrix the stimulation reagent is applied volumetrically and does not require a bead-to-cell ratio calculation. T Cell TransAct is available in both research grade and MACS GMP Grade, making a seamless transfer of T cell processing into a clinical setting possible. MACSiBead™ Particles are large cell-sized particles that can mimic antigen-presenting cells. These particles can be loaded with any kind of biotinylated antibody to activate and expand certain primary cells. 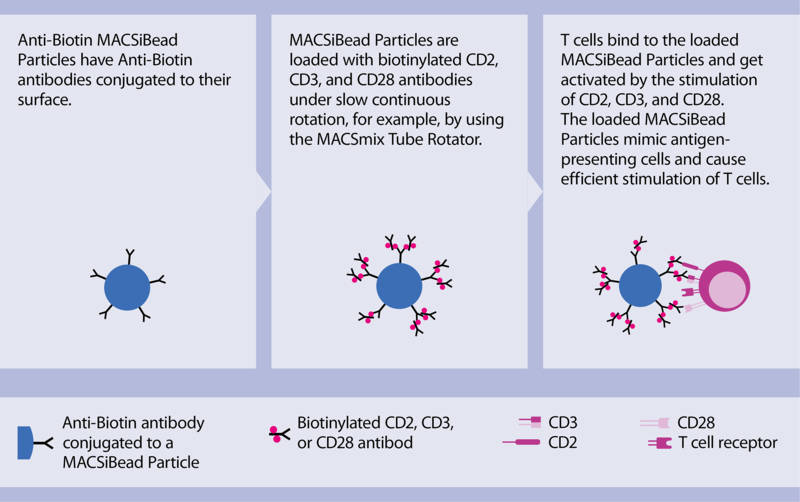 When loaded with CD2, CD3, and CD28 antibodies, for example, MACSiBead Particles activate T cells effectively. Reagents based on these particles need to be applied in a specific bead-to-cell ratio. Miltenyi Biotec provides dedicated kits for the functional characterization of cells in suppression assays or reliable expansion of immune cells and cell subsets based on MACSiBead Particles. Principle of MACSiBead Particles exemplified by stimulation of T cells. CytoStim™ is suitable for rapid stimulation of CD4+ and CD8+ T cells in fresh peripheral blood mononuclear cells (PBMCs), whole blood, or other leukocyte-containing single-cell suspensions from tissues. It can be used as a non-toxic alternative to SEB for a positive control in antigen-specific T cell stimulation assays or intracellular cytokine staining experiments.